Fabulous late Victorian gothic interior, with magnificent stained glass windows. Only drawback is that all the beers are keg. Since I have a fondness for pubs with good architecture, especially late Victorian or Edwardian ones, I liked this pub immediately on walking in. The neo-Gothic arches and wooden panelling are superb. Sam Smiths is not my favourite beer but they do compensate by keeping the prices down; £3.10 a pint made it a cheap round! Another beautiful Sam Smith's pub, and like many others, nearly deserted on a Saturday afternoon, even though well located for passing trade. The barman told his (few) customers the story of the stained glass, apparently destined for destruction. Thank goodness they were saved, as the sunlight filtering through made the pub very, er, angelic. Nice pint of OBB (2.90) & good service. 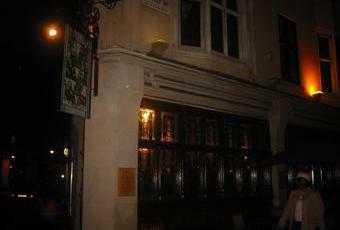 A traditional Sam Smith’s pub on the Marylebone High Street, it consists of a single downstairs room with dark wood panelling on much of the walls and another room upstairs although we did not investigate this. Food is offered here apparently, but we did not check the menu. 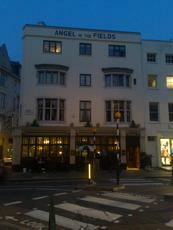 The pub sits on a corner plot, but the side road is not quite a right angle, and consequently the bar has a slight wedge shape to it. Stained glass windows are on two sides which is an attractive feature, and this together with the wood panelling and dark brown paint on the ceiling lends it a traditional Victorian ambience, although the red lino like floor covering could perhaps be improved. A small bay window is an unusual feature between the stairs and the bar. A fire-place was at the rear, although whether this is still in use I am unsure and there was a darts board in one corner. Beers on tap were the usual somewhat uninspiring keg range from Sam Smith’s and consisted of their Old Brewery Bitter and Sovereign. The solitary cider was also their own Reserve. Had some drinks with old workmates last Wednesday. Very pleasantly surprised at how good the place was. Would recommend for drinks, but don't know about food as none was available.